Gabe Willis has been a mainstay of the gulf coast music scene for the last decade. As both a solo artist and a singer songwriter for Paw Paw's Medicine Cabinet, his music is known for striking a balance between complexity and accessibility. Lyrically thoughtful and melodically contagious, Nappie award winning artist Gabriel Willis is one you won't want to miss this month at The Book Cellar at Page and Palette. Joe Langley, of The Marlo Boys, was Artist in Residence at The Book Cellar in July and was received with great applause and admiration. Joe's songs and voice are beautiful, and he gifted instrumentally, playing guitar, harmonica, pedal steel & banjo. 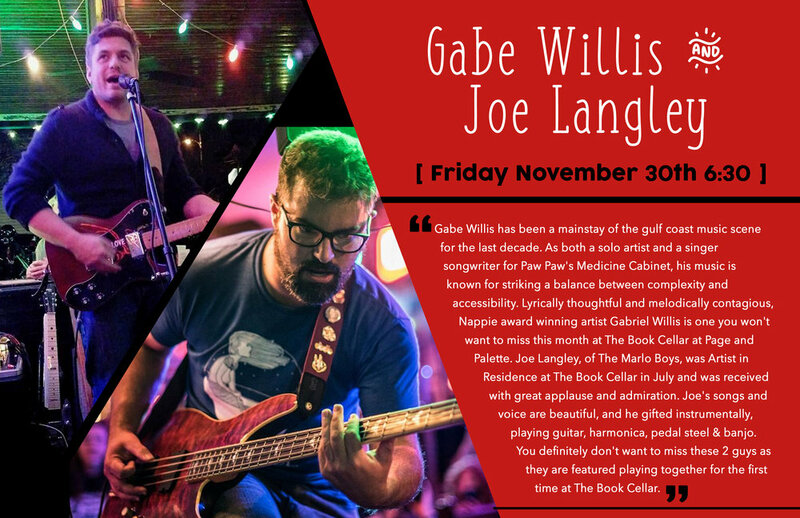 You definitely don't want to miss these 2 guys as they are featured playing together for the first time at The Book Cellar. Community Guitar and Uke lessons at the Book Cellar!